When Vanessa Patricelli first heard Kshama Sawant speak, she thought the socialist was nuts. It was November 2013. Sawant had just been elected to the Seattle City Council as a member of the Socialist Alternative party. And Boeing was threatening to cut thousands of jobs if its machinists didn’t give up their pensions and Washington State didn’t hand the company $8.7 billion in tax breaks. Patricelli, a public hospital nurse active in her union, had joined a downtown Seattle rally for the Boeing machinists with labor leaders and allies. When Sawant took the microphone, she declared her solidarity with Boeing employees, adding that if the aerospace giant wanted to engage in “economic terrorism,” the workers should take over the factories and place them under democratic control. Yet two years later, on election night 2015, Patricelli was celebrating Sawant’s reelection along with hundreds of union members, students, housing rights advocates, LGBTQ activists, and radicals of various stripes at the campaign’s party. Patricelli’s journey from Sawant skeptic to Sawant enthusiast offers an important glimpse into how political action can radicalize. It also counters the myth that in order to be viable, progressive political candidates have to tack to the center. In winning over people like Patricelli and securing reelection, Sawant hasn’t just demonstrated that ordinary people are receptive to unapologetic left politics—she’s fostered a citywide discussion about capitalism and socialism. However, socialists in Seattle now face a mayor and City Council majority more united than ever in their desire to marginalize Sawant and the movement around her. Can Seattle socialists expand their base and advance progressive reforms like rent control and a tax on the richest residents? And what can left activists elsewhere take from Seattle to launch their own progressive candidacies? Sawant, an adjunct college professor and leader in Socialist Alternative, was a failed state legislative candidate in 2013 when she challenged Richard Conlin, a 16-year incumbent and Seattle City Council president. Conventional political wisdom held that Conlin would skate to reelection. Progressive organizations, environmental groups, and most unions endorsed the incumbent. But Conlin slipped up, notably by being the sole council vote against a union-backed sick leave ordinance. And he underestimated the strength of Sawant’s ground campaign, fueled by volunteers—many newly energized by Occupy—who staged rallies and door-belled aggressively. 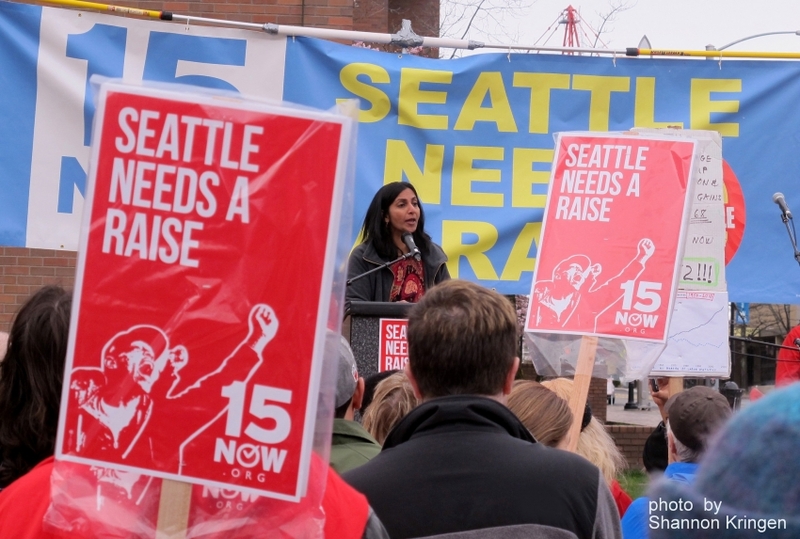 Sawant netted 35 percent of the vote in the three-way primary and advanced to the general election, making the demand for a $15 minimum wage central to her campaign. In campaign speeches she issued unabashed calls for worker justice, rent control, and a tax on millionaires and her bright red “$15 Now!” yard signs sported a worker with a raised fist and her socialist party’s name—hardly the stuff of moderation. In November 2013, she beat the incumbent by 3,000 votes out of more than 180,000 cast. Seattle had elected its first socialist in a century. Once in office, Sawant made it clear that her success inside City Hall depended on the strength of the popular movement outside. “My voice will be heard by those in power only if workers themselves shout their demands from the rooftops and organize en masse,” she declared at her inauguration. She also signaled she would operate unconventionally as an officeholder, accepting only an average Seattle worker’s paycheck—$40,000 after taxes—and donating the remainder of her $117,000 council paycheck to a solidarity fund to support striking workers, affordable housing, civil rights, and other causes. 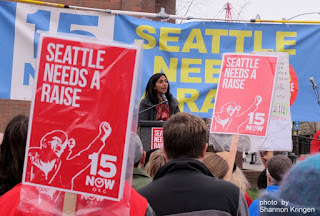 Seeking to counter the mayor’s closed-door negotiations, Sawant and her supporters held demonstrations and prepared to file a citizens initiative that would extend a $15 wage rate, on pro-worker terms. In late April, 2014, they turned in the papers—and days later the mayor announced his own union- and business-backed plan to establish the first $15 minimum wage in a major American city. “Staving off an initiative battle was, in fact, the driving force behind Murray’s commitment to getting a deal,” observed local political reporter Josh Feit. The mayor’s agreement contained a number of pro-business concessions, including a prolonged phase-in period and, for the time ever, a tip penalty – a lower minimum wage for tipped workers. In reaching the closed-door deal, the mayor successfully corralled labor leaders who otherwise might have backed the socialists’ grassroots effort. But the precedent had been set. The $15 wage that seemed impossible just months before had been won in Seattle, and it spurred the $15 movement nationally. Sawant also has been active on housing issues. When Seattle public housing officials proposed a 400 percent rent hike, Sawant built an alliance of tenants and community groups to fight the idea, mobilizing hundreds to protest at meetings where officials presented the new rent plan. The authorities backed down. During the city’s budget process—normally a staid affair of daytime council meetings and closed-door negotiations—Sawant convened a People’s Budget forum. Workers, housing and human services advocates, bus riders, and others took turns spotlighting the deficiencies in the mayor’s spending plan at a standing-room-only meeting in the city council chambers (scheduled by Sawant in the evening so working people could attend). The full council, apparently feeling the pressure, went on to adopt Sawant amendments to fund a year-round women’s shelter and enact an immediate $15 minimum wage for city employees. In Sawant’s first two years in office, the forum became a staple of the councilmember and her party—a new form of popular democracy. Seattle’s Capitol Hill neighborhood has seen a surge in hate crimes against members of the LGBTQ community in recent years. In response Sawant and other activists organized a forum in early 2014 that drew four hundred. Based on testimony from forum attendees, organizers crystallized a community demand for an LGBTQ youth shelter, which Sawant has championed in City Hall. Sawant also convened a teachers forum as Seattle public school teachers prepared to strike last September, and earlier in the year filled City Council chambers for a discussion on rent control and affordable housing measures. Following the housing forum, the city’s establishment political leaders—who for years have been loath to discuss any form of rent control — pushed through a city council resolution calling on the state legislature to lift the ban on local rent stabilization laws. The forums became opportunities to spark a larger conversation—in the blogosphere, local newspapers, coffee shop gatherings, and within unions and community groups—about why such problems exist and the idea of socialism, not in the ethereal sense but at the municipal level. Out of this discourse a number of proposed initiatives have gained momentum: public broadband; a city-run, not-for-profit bank; and a millionaire’s tax. In welcoming people into the forums, Sawant has stressed that they—not the political establishment—own city hall. Instead of decorous meetings before a largely empty room, the councilmembers have faced crowds filling every corner of the chambers, spilling out into the hallways. To political elites, the new crowds are unruly, disruptive, and disrespectful; to the newly energized activists, they’re an inspiring expression of participatory democracy. In cultivating a new political discourse, Sawant has planted one foot in city hall and the other firmly in the streets. Take, for instance, her televised arrest in late 2014 in front of Alaska Airlines headquarters, in protest of the company’s refusal to honor the voter-approved $15 minimum wage at SeaTac Airport. But what transpires outside the glare of klieg lights can be even more revealing. Last winter, Sawant’s staff got a call from a constituent. Kathy Heffernan, a hospital chaplain, had just received a notice that her landlord was raising the rent – from $1,000 a month to $2,300 a month. A typical elected official might assign staff to look into the situation, perhaps make an inquiry or two, and offer empathy to the constituent. Instead, “Kshama came to my apartment to meet with us in my living room,” Heffernan recalls. “She listened to our stories. She helped us to strategize a plan to win relocation assistance.” Sawant also urged Heffernan to channel her frustration into the fight to make housing a human right. The hospital chaplain took up Sawant’s challenge, and has become a leading advocate in the local housing justice movement. Sawant’s organizing approach paid off: Her reelection campaign drew supporters in record numbers. More than 600 people volunteered for door-belling, phone calling, and literature distribution; nearly 4,000 people donated to the campaign for a total of $450,000. Instead of vying for an at-large seat, as she had in 2013, Sawant ran in 2015 in one of the city’s seven new districts. Her District 3 encompassed Capitol Hill – home to thousands of renters and the heart of the LGBTQ community; the Central District, the epicenter of Seattle’s African-American community; several medical centers; older single-family home neighborhoods in the process of gentrification; and the wealthier private homes along the shore of Lake Washington. It’s a diverse district, tilting left. Volunteers and staff for Socialist Alternative put together a comprehensive grassroots effort, knocking on 90,000 doors. The party has six branches in Seattle — neighborhood committees averaging a couple dozen members apiece. In addition to the more traditional campaign recruitment of union members and community activists, each branch was responsible for a quota of volunteer shifts and for bringing in additional volunteers. The mayor and his political allies went all out to beat Sawant, recruiting Pamela Banks, a long-time community liaison for the city and CEO of the local Urban League. Banks, an African-American, was the perfect liberal establishment counterpoint to Sawant. While Sawant, an Indian immigrant, has cultivated relations in communities of color, the active membership of Socialist Alternative has been disproportionately white and male. Banks supporters pointed out the racial divide to recruit support in African-American and Asian communities. Interestingly, red-baiting did not materialize as a major attack line; Banks and Democratic Party consultants hinted that early polling showed it was not an effective tactic in the district. In addition, by fully embracing the socialist mantle, Sawant insulated herself: voters knew precisely what they were getting with her, and even decidedly non-socialist political activists appreciated her forthrightness. The full spectrum of Seattle’s political establishment—essentially ranging from pro-business Democrats to social and economic liberals—endorsed Banks, sponsored fundraisers, and appeared in campaign ads. More than 100 corporate executives, landlords, private equity principals, and bankers donated to Banks’ campaign. And in the final two weeks, a Republican Party–led independent expenditure committee came in with multiple mail pieces and a robust phone operation. But Banks faced a daunting headwind, as even her political allies acknowledged. Anderstone was correct to point out that Sawant had tapped into voter anger, but like other political consultants he missed the real lesson. Where pundits saw only frustrated voters, others saw a political leader who inspired frustrated people into action with an affirming message of hope through organizing. But while Sawant has normalized the idea of socialism in Seattle, it remains unclear whether Sawant’s 2015 win will end up spurring other viable socialist and left candidacies, or whether it turns out to be a political anomaly in the upper left-hand corner of the continental US. That will depend on her party’s agility inside and outside City Hall, as well as the response of key working-class constituencies, especially unions. As for Seattle Mayor Ed Murray, when he inevitably doubles down on efforts to marginalize Sawant in city politics, he’ll do so with the support of a council majority and knowing full well that in the fight for a $15 minimum wage, he successfully lured union leaders away from Sawant’s bottom-up strategy and into a compromise achieved behind closed doors. Nearly all Seattle unions endorsed Sawant’s reelection; many turned out members for doorbelling and phone-banking. But when push comes to shove in the next big fight, will union leaders fall back on familiar relationships with the political establishment, or be willing to place issues ahead of loyalty to Democrats? The coming years are a test not just for Sawant but also for a labor movement—in Seattle and beyond—that historically has been unwilling to abandon its co-dependence with the Democratic Party and embrace independent class-based politics. Beyond Seattle, what are the lessons for local left politics across the US? One is that political activists frequently underestimate popular alienation from capitalism and openness to alternative politics. Seattle is not Topeka or Albuquerque or Birmingham, and independent politics will manifest differently based on local circumstances. But Sawant’s reelection signals that an independent politics grounded in working-class interests can resonate with politically disengaged people. The time is ripe for organizing along these lines. A second, related lesson is that radical political campaigns will find success to the degree that they focus less on how to win immediately at the ballot box and more on building a working-class movement. Socialist Alternative initially ran Sawant not with the primary goal of winning elective office, but with the aim of engaging workers and students in a range of issue fights, through which more people would come to recognize how the political establishment had failed them and the need for independent action. Ironically, by not caring about winning in 2013, Socialist Alternative energized a working-class base and improved Sawant’s actual chances of success. A third lesson is the indispensability of organization behind any electoral effort. In Seattle, Socialist Alternative is a relatively small party—much smaller than local Democratic Party organizations—but it’s organized in different neighborhoods, and its members are connected to a broader base of union and community activists. By rooting the candidacy in the party organization, the 2015 campaign was able to tap institutional memory from 2013 and earlier races. Campaign strategies and tactics were not directed by a single candidate or campaign manager, as is typical in most local electoral campaigns, but were developed through collective, thoughtful discussions. This would be quite difficult if not impossible for individual progressive candidates who lack an independent base. Indeed, many progressives who claim political independence but run by default as Democrats find themselves drawn inexorably into Democratic Party politics and the party’s attitude of ambivalence—or worse—when it comes to defending workers against business interests. In addition to the prospect of local socialist candidacies—the Socialist Alternative party almost won a seat on the Minneapolis city council two years ago and may try again there or elsewhere—there’s the opportunity for radical labor-backed candidates to run for office. Unions with active rank-and-file memberships provide a ready-made organizational foundation. Will they take the plunge into independent electoral bids? Doubtless pundits will be looking to see what happens with Sawant now that she has won reelection, but the bigger question for the US left is whether similar candidacies sprout up in other cities in the coming years. Sawant certainly has proven that it’s possible, under the right conditions and with relentless grassroots organizing, for a socialist to win local office. Now the question is how broadly that can be replicated. > The article above was written by Jonathan Rosenblum of Alternet, and is reprinted from In These Times.